Hey Minnesota! It's almost time for my favorite week of the year. February 12-16, 2019. I'll be home and headlining ACME in Minneapolis! Call Acme or get tickets here now. 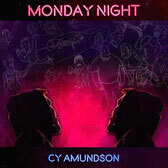 Preview, download or stream Monday Night by Cy Amundson.